This probiotic is often found in the colon and has many digestive, immunity & many other researched health benefits. I wanted to share my testimonial with you. I and my family have easily referred at least 20 people to Custom Probiotics. I was very sick with gut Candida, an ulcer caused by h. Pylori along with a weakened immune system. I was getting sick ALL the time. I had nearly constant nausea and stomach pain. Since starting the probiotics over a year ago I've been diagnosed with Hashimoto's thyroiditis which explained my weakened immune system. My mom spent a good amount of time researching natural ways to help me. She found and bought the 11 Strain antibiotic recovery Custom Probiotics for me. I started taking them and within a few days I started feeling drastically better. It was truly amazing. These probiotics are expensive but for me they have been absolutely invaluable. They've been the single most important thing I've done to regain my health and vitality. Anyone with gut or immune issues should get these. You absolutely will not regret it! I cannot recommend more highly. Thank you for creating such a wonderful product, Harry! It has helped me so much. After being on your 11 strain probiotic for almost 3 years now I decided to go up higher past 450 Billion as i could not take anymore due to constipation. But then i was able to go up again and all of a sudden the fungus that was in my body for 6 years started coming out!!! Long white strands out of my digestive track in my bowels and peeing out tons of foamy little strands of fungus. It just keeps coming out. I am so happy!!! Your probiotic is the best in the world! I will stay on your probiotic for life but also want to make yogurt as i found the secret to healing all diseases is to take Trillions of probiotic daily. I have suffered for years with chronic intestinal problems. The doctors answers for all my problems and symptoms was antibiotics. I have had so many rounds of antibiotics it is frightening. In May 2015 I was rushed to the hospital to discover that I had diverticulitis. I was there for four days and they loaded me again with antibiotics, intravenously giving them to me every hour on the hour for four straight days. I am 54 and I own my own business and have to work if I want to eat. My health was exhausting me, chronically bloated, digestive issues, depression from the weight of how my body felt, I always felt sick, and of course I was having major problems having consistent bowel movements. My intestinal issues were truly getting in the way of living a productive life. I was desperate to find something that could really work to help cure what was happening in my gut. I did not want another round of antibiotics because it was not curing the root problem. A friend of mine suggested taking custom probiotics and I got them right when I left the hospital. 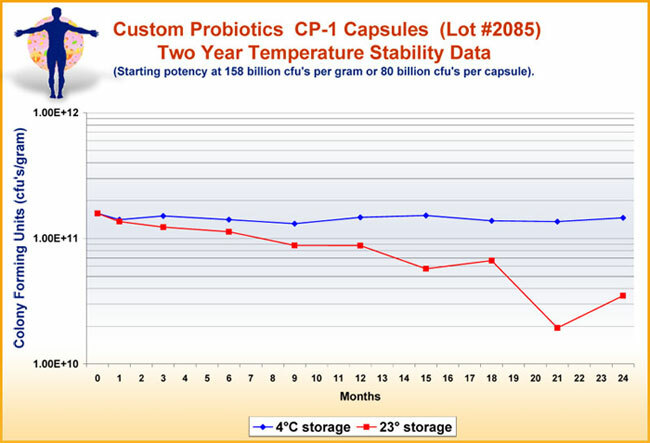 I had taken over the years many other brands of probiotics so I was very sceptical that they would make a difference. I started taking them diligently day and night. I started a regimen of two scoops in the morning and two scoops at night, this was the 11-strain probiotic. Once I was hospitalized and I found out I had diverticulitis I was scared. I do many shows for my business and I rely on this income to survive, if I had another attack during a show I could stand to lose a lot of money. So my motivation for surviving was not just physical but it was economical. In about two months my bowel movements were very regular and there was no bloating. I do watch what I eat, I do not in general eat any sugar and I follow a low food map diet. I always ate pretty well but I am very careful now. Seven months later and I have not had any reoccurrences. I have two to three bowel movements a day, which is great for me, because in the past I was lucky to even have one. If you do not know anything about diverticulitis I will inform you. You have to carry around with you two to three different strains of antibiotics at all times and if you feel a pain starting to arise in your intestines on the left side you must instantly start taking the regimen of antibiotics. This is what I did, and I am no doctor but this worked for me. I had started to have real pain on my left side the exact pain that landed me in the hospital. So instead of taking the antibiotics I doubled my dose of probiotics for 3 days and gratefully my symptoms went away. This is fantastic I did not have to take antibiotics. They are great for curing once I. Awhile problems but taking the two or three times a year for years is just down right MADNESS! I do not go anywhere without my custom probiotics. I now order the 11-strain and the 6- strain and I take 1 scoop from each bottle morning and night. I am so grateful to take these. I feel great!!!!! I am tired of doctors putting band aids on large problems and I feel like I have taken a huge step forward for being responsible for my own health. I wanted to write and let you know that my son who is 5 yrs old has had molluscum on his back for about a year now. I ordered myself the 11 strain powder for candida and so I decided to start him on it as well. After a few doctor’s appointments where they tell me nothing can really get rid of this virus and it can last up to 3 years I figured it can’t hurt to try it. It has been almost a month now and the virus is clearing up. I have included pictures of his back when I first started and what it looks like today. We are so excited we didn’t have to use the prescription that the doctor had given us and potentially burned his skin. So a BIG THANK YOU!! I know that a lot of kids suffer w/this condition, I hope you can put this out there so parents know there is a way to clear it up. As for me, I have been seeing a specialist for my candida problem for months and nothing seemed to be helping me. It was the worst thing to be suffering with this problem and not having any relief. I call this pro-biotic my “miracle in a bottle”. For the first time in a very long time I am feeling so much better. I have been recommending this to all my friends! Thank you so much.